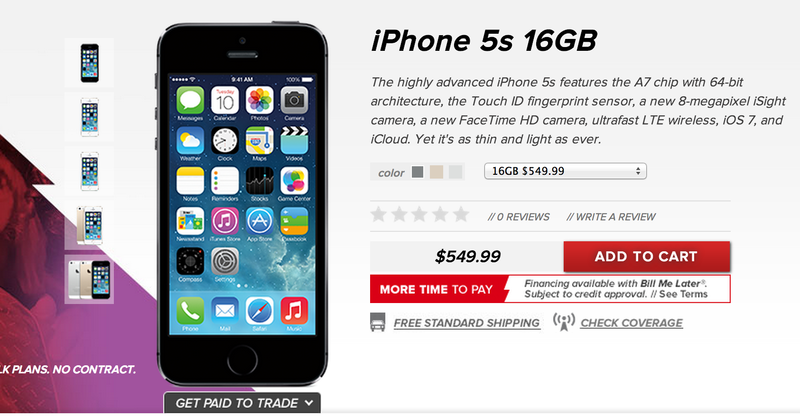 We knew Virgin Mobile was launching the iPhone 5s and 5c today, but we weren’t expecting a $100-off starting price. That’s what’s on offer today from the Sprint subsidiary (Sprint will also knock off $100 the subsidized plans if you are a new customer – so much for loyalty benefits). Virgin’s plans are the least expensive out there, especially considering they include unlimited data and start at $30/month. We’ve just received word that Virgin Mobile will be carrying the iPhone 5 next week on its Beyond Talk plans with unlimited 3G/4G LTE data and messaging starting at $35/month (with $5 discount for auto-payments). The 16GB iPhone $549.99 pricing plan + $30/month for unlimited data is extremely competitive with what’s out there but this comes late in the update cycle. Virgin, a pre-paid division of Sprint which also uses the carrier’s CDMA 3G and LTE 4G networks, will also offer the 32GB and 64GB versions of the iPhone for $649.99 and $749.99 respectively. For instance, a 16GB iPhone 5 on the $30/month plan will cost $360+$550=$910 over a year or +$360= $1270 over 2 years. Virgin Mobile USA will launch the iPhone 5 on Friday, 6/28/12 on its Beyond Talk plans, with unlimited 3G/4G LTE data and messaging* starting at $35 per month but customers can also receive a $5 per-month plan discount when they register and sign up for automatic monthly payments [“Auto Pay”] with a credit card, debit card or PayPal account, making the iPhone 5 available on Virgin Mobile for as low as $30 per month**. The 16GB iPhone 5, available in Black and White, will be available at www.virginmobileusa.com, at participating Virgin Mobile dealers, and at RadioShack, our exclusive national retail distributor,for $549.99 [excluding taxes]. The 32GB and 64GB, also in Black and White, will be available online only for $649.99 and $749.99, respectively. *All plans include 2.5GB/month of 3G/4G full speed data. **Requires registration for automatic monthly payments and Virgin Mobile Service is subject to Terms of Service found atvirginmobileUSA.com.